Jakob grew up in the Swiss Alps in Switzerland literally next to the Swiss Alps 100 course. He moved to the US in 1998. He always missed the Alps and because of that organized the Swiss Alps 100 to allow runners from all over the world to experience the Swiss Alps paradise. He gained a lot of experiences directing an ultra marathon by being a co-RD and 50% owner of the famous 5th oldest 100-miler in the USA the Angeles Crest 100. He is an avid runner who started running in 2005. Since then he completed over 200 races including 70 marathons, 45 50Ks, 14 50-miler, 4 100K, 26 100-miler, and one 144-miler (twice around Lake Tahoe in California). In Switzerland, he so far has run the Aletsch half-marathon, the Zürcher marathon, the Swiss City Luzerner marathon, the Zermatter marathon, and the Zermatter ultramarathon. His other passion is coding websites. He is the webmaster of SA100, SD100, AC100, PCT50, ANF Trail Race, Oriflamme 50K, Julian Full Moon, SoCal Ultra Series, and others. Lastly, he is also the founder and webmaster of penpalworld.com, which has over 2 million members, and ultraFanatics.com, an ultra runner's hangout. Tom started running along the northern beaches in Sydney in 2007. Since then he has returned to Switzerland and come to love trail running in the mountains. He has run more than 20 marathons and more than a dozen 50k, 50mile, and 100k races. He started his 100mile career at the 2016 Angeles Crest 100. He is a passionate supporter of Room to Read (www.roomtoread.org) and has led the Room to Read Yak Pack fundraising effort at the Jungfrau Marathon five times, including one double (out and back) with the intrepid runners KG and RD. The Yak Pack has raised funds for hundreds of girls' scholarships in twelve developing countries including Nepal, Indien, and South Africa. He lives with his family in Basel, Switzerland and loves training in Cumbel, Val Lumnezia in the southeastern canton of Graubünden. Let him know if you're in the area and want to join on a great trail run. “By day” he is a co-founder and CEO of the vaccine company, Vaxxilon. Christian Langenegger started casually running in university. However, it was only after he moved back to Switzerland from Canada that running became a mainstay of his life. 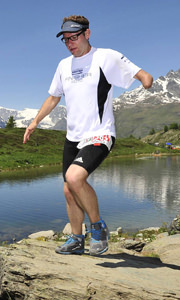 In 2009, he ran his first marathon in Lucerne and was hooked. From there he went on to run approximately ten marathons a year till 2014. This year marks Christian’s return to running after a two-year hiatus, and there could be almost no better return than in helping with the Swiss Alps 100. Like Tom, Christian also actively supports Room to Read. 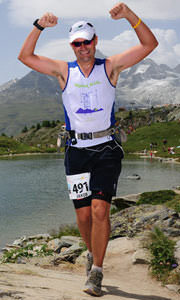 In fact, it was running the Jungfrau Marathon for the charity where the two met and have developed a great friendship. Christian lives at the foot of the Uetliberg in Zurich with his girlfriend. His typical run is an out-and-back to the top of the Limit City’s local mountain. When he’s not running, writing or travelling, he’s working as a senior strategy consultant with Swiss Approach Group Ltd. I'm Mirco Weiss, and have been living in Randa in the beautiful Valais for 5 years. In 1996 I was born in Winterthur. Since I was little I was interested in the medical service and I always went with my parents. Since I live in Valais, the Swiss Alps 100 is almost right on my doorstep. I completed my apprenticeship as a cable car mechatronics engineer at Zermatt Bergbahnen AG, and then I finished the cable car expert. I am much in the nature and in the mountains. I started with the first medical courses at a very early age and always liked to be involved in medical services. In 2016, together with a few colleagues, I founded a Military Sanitary Association in the Upper Valais and now run it as President. In 2017, I was allowed to complete the instructor SMSV for various emergency and first aid courses. I have a lot to do with medical services, and since I also live in the mountains, I can contribute a lot. Otherwise, I spend a lot of my free time hiking, biking or skiing in the winter. I'm Swiss and I live in the east of Switzerland. The Lake Constance (known as Bodensee in German) and the Säntis mountain is virtually in front of my front door. I was born in 1970 and I'm married. I am an examinated health professional EFZ (Federal certificate of Competence) and I often work as a medical personnel. Hobbies: If I am not in the service then I lace the running and hiking boots. Ultra-trailrunning and hour runs are my passion. At the Swiss Championship 2016 Over 24 Hours I earned the bronze medal. And those experiences I recently started to work on novels - as an author. Peter Lauer leads the doctor's practice Obergoms GmbH and has a specialist training for general medicine. He will be on call at the race weekend as a race doctor.